It’s an instant classic! 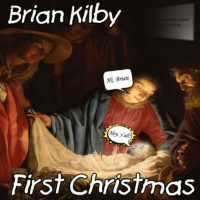 It’s First Christmas, Brian’s third Christmas album! Featuring such classics Oh Holy Night, Oh Christmas Tree, and oh so much more! On today’s Happy Daily: Brian and Kim just saw the new Star Wars movie. No spoilers! On today’s Happy Daily: It’s your weekly information and inspiration from the community voice. On today’s Happy Daily: Brian shares his favorite Christmas song. On today’s Happy Daily: Today’s episode goes out to a fine young man who was not treated well by his peers, but I want you to know little buddy that things get better. 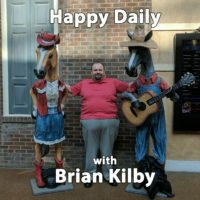 On today’s Happy Daily: Brian talks a little bit about Episode VIII which is coming out this week, so we revisit Brian’s review of Episode VII. On today’s Happy Daily: Cereal Part 9. It’s the penultimate episode of Cereal. On today’s Happy Daily: Brian’s coming down from his meds and enjoying a snow white Friday night. On today’s Happy Daily: Brian has some awesome new meds. On today’s Happy Daily: The Community voice is your forecast for the future.